How I completed Clocked at 32 MPH. First things first. Failing to plan is planning to fail. My first steps were to plan out my enclosure sizes, species combinations, quantity of dino's etc. You can use the setup I have here. While herbivore pen sizes and composition are negotiable, I picked out the species I felt I would have the least trouble maxing out the genome. Pen sizes are the number of fence lengths at max distance, so for a 3 X 3 pen, that was 3 max lengths of fence in each direction. Pen positioning was pretty much all side by side, running the length of Nublar in pretty much a straight line. Basically the pens went 1,4,2,3,5,6 then I ran out of room and moved further down the map to make pens 9,8,7. 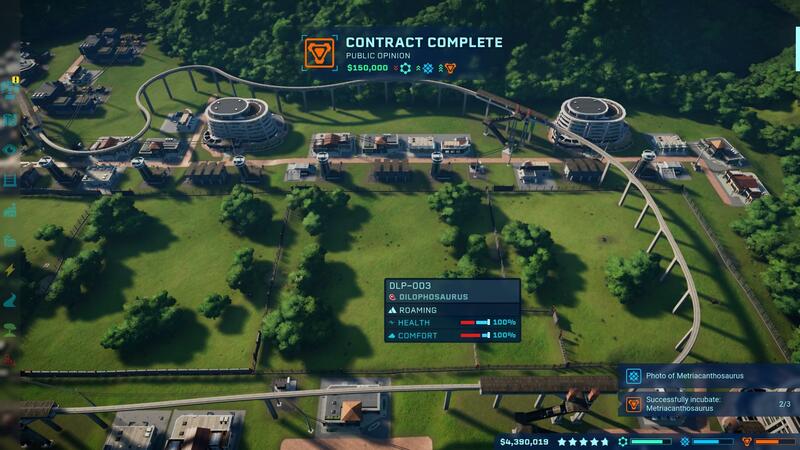 Screenshot 1 - shows pens 1,4,2,3 (note that initially each pen had a creation lab, but due to completing planned fill of dinosaurs and the fact I had to clear some space to install things like monorail, entertainment facilities etc, these were removed). Screenshot 2 shows pens 3,5,6 (same above regarding some of the creation labs being removed). My build order went like this. Straight road from the entry point in 2 lengths. Road at 90 degrees to entry road, leaving enough space to place the power plant. Gift shop (on opposite side of road for spacing purposes when I got to the fences/enclosures). In between sending the first few expeditions, their return and subsequent processing of fossils, I researched fossil extraction speed and inventory space for the fossil centre and applied 2 x extraction speed and 1 by inventory (as you'll see below, my plan was to max out a genome before deploying species to the park, so extraction speed was quite important). The other research item was incubation speed, as I was going to be taking longer to max out the genomes, I had to incubate the dino's as quick as possible, so each step of the way, I maxed out the incubation speed with the upgrades available at the given level. 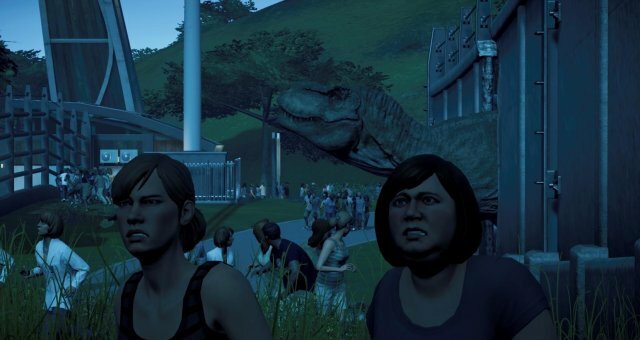 My plan of attack was to max out the genome before pumping out any dinosaur, this gave me sufficient time to start constructing enclosures and saving money. In the screenshot, the first 2 pens that were constructed were 1 and 4. 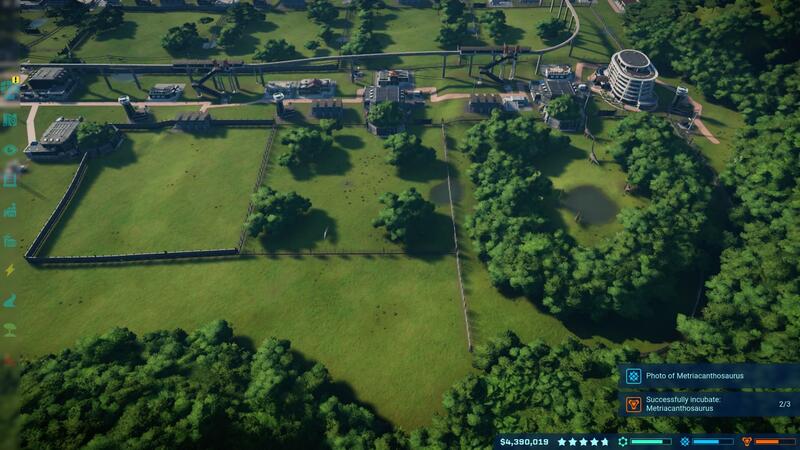 Started by going three lengths of fence across parallel to the road and just far enough behind the gift shop I constructed at the start, then went down 2 lengths and closed it off, I tried to get the creation lab as central as possible and then ran a fence right through the middle, a small patch of water under the centre fence and some patches of forest completed the enclosure. Not long after getting the viewing gallery in place (this was forward of the fence, not actually straddling the fence as you might expect) I had run enough expeditions to complete the Triceratops genome, the park was finally going to make some money from attractions, i.e. Dinosaurs. I feel that my decision to max out a genome before putting it in the park, gave me more time to lay out my enclosures without feeling rushed. Upon achieving the first star, the very first thing I did was to research "research team bravo", then started sending out more expeditions while waiting for it to complete, the next 2 research items were dig yield and dig team bravo, once those were done, I went and got each of the new medicines required, lastly I researched the restaurant, clothes shop, power plant, baryonix fossil access and heavy electric fence, this was pretty much all I got for the research in this star level. In between expeditions and extractions, I constructed pens 3, 5 and 6. I saved Raptors for last, as I didn't want to deploy them too early, experience in previous play throughs meant I was usually getting my first bad storm just before I reached the second star about the 1hr to 1hr 10 mark, as the Raptors typically went nuts in the storm and always broke out, it was going to be one less issue to deal with by not deploying them until after the storm had passed. I received my second star around 1hr 25mins. In between expeditions and extractions, I finalised construction of pens 7,8 and 9. 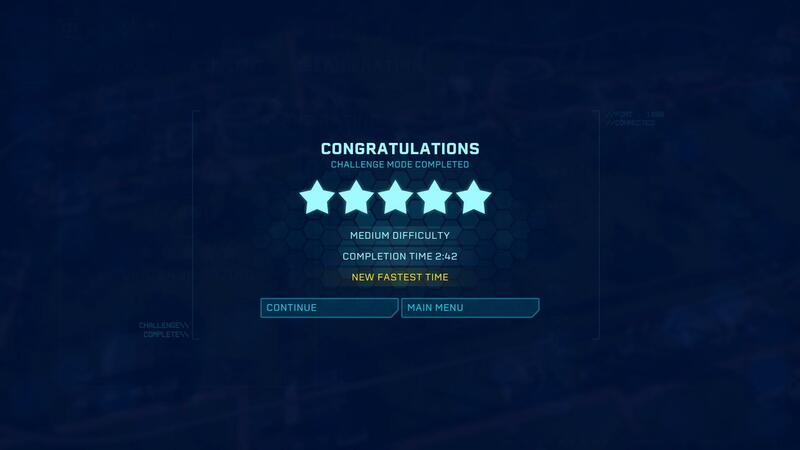 Due to the deployment of various dinsoaur species I got my third star before I had finished getting the genomes maxed out, but fortunately my plan wasn't going to require even more fossils being dug up, one I got the third star, I immediately researched Indo-rex and built his pen and got him incubating, while continuing with expeditions and extraction. Not all that long after getting out the Indo-Rex and several of the Sauropods, I received my 4th star, immediately went and researched Indo-Raptor and got him cooking, again while continuing with maxing out the last of the species I was planning to put in. Once I released the Indo-Raptor, I checked my star rating and realised I had actually maxed out the dino star rating and it was actually my facility rating holding me back, I noticed this at the 2hr 30min mark, just as I realised this, the second major storm hit, I figured I would have to just hope for the best regarding the dino's not breaking out and concentrated on improving facilities. I knocked over the now unnecessary creation labs and frantically placed the additional monorails, bars etc to fix the issues for the facilities and deleted one of the viewing platforms I had way off to the side, this was then enough to max out dino's and facilities giving me that glorious achievement. 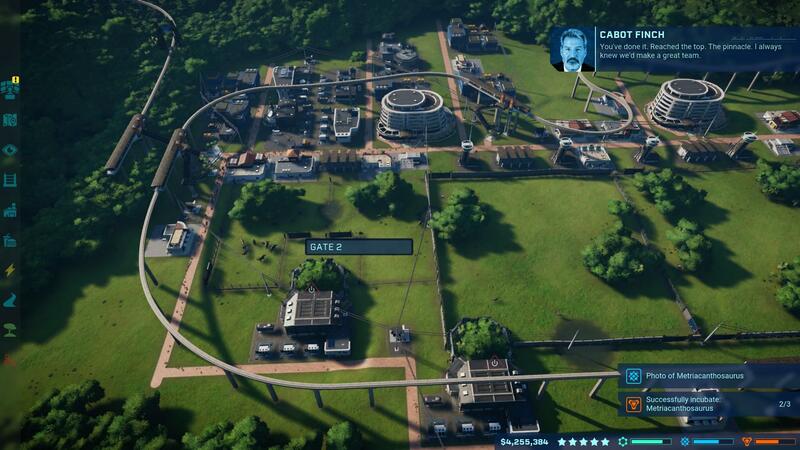 Ensure the pens are fully setup before letting the dino's in, a few extra seconds ticking the boxes, ensuring plentiful food and water sources (expecially for the shared carno exhibits where the big guys harass the little guys) saved plenty of time by again not having to round up angry dino's. Check dino comfort levels when they are released, this is another backup to my above point, happy dino's are good dino's even badasses like velociraptors. Absolutely prioritize expeditions and extractions, half way through building a pen and you hear the chopper coming back, get straight to it and put them back to work. I used absolutely no genome modifications, as these add unnecessary costs to the incubation and don't pay off as well in the long run, as the dino's can cost 4-5 times more for only 2-3 times the star rating. Cancel contracts you are not going to finish quickly, my list of immediately cancelled contracts were "dino with X modification", "photograph X", "Achieve X star rating" and a few others I don't recall, the main point here is to keep the funds flowing. The reason I opted to max out a genome before deploying it was mostly based on saving cash and to give me a bit more breathing room when building/researching/planning the next expedition, I found in earlier attempts, I felt very rushed, just trying to pump them out as quickly as possible, and got very annoyed when a dino failed to incubate, doing it this way meant there was no chance of failure and therefore saving money and nerves. Using this method, I didn't feel the need to save every few minutes and reloading whenever something went wrong.